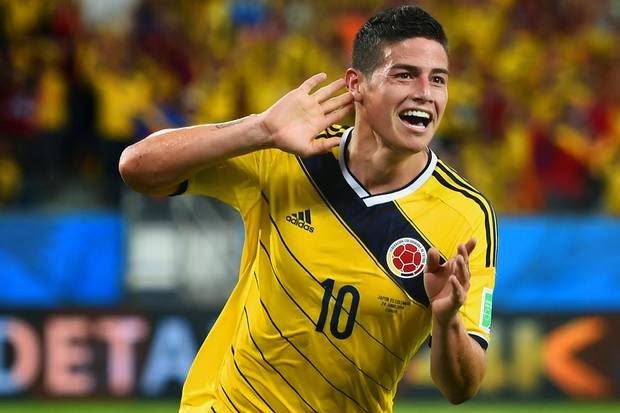 James Rodriguez has been the biggest star in the 2014 World Cup in Brazil, and the main reason why Colombia is now in the quarter finals of the tournament. Going into this summer’s World Cup not many believed Colombia could overcome the loss of their biggest star, Falcao. He is one of the best if not the best striker in world football and his injury during a cup game for Monaco seemed to be something out of a nightmare and perhaps the start of the derailment of Colombia’s hopes of having a successful World Cup. What the football pundits didn’t count on was a fabulous James Rodriguez that would take his team on his shoulders and carry the mantle left unattended when Falcao wasn’t able to join the squad in Brazil. For those that have seen James Rodriguez play and have followed his career since he has arrived in Europe, this is not a surprise, it is plainly a confirmation of what all had seen and witnessed. He first shined at the Toulon Tournament in 2011. This is the biggest U20 tournament, besides the U20 World Cup, and he not only led Colombia to victory he was also named MVP of the tournament. Three years later we are looking at him outperforming what he had done in Toulon at the 2014 World Cup, proving his undeniable talent and perhaps trying to repeat history and prove that he can lead his country not only at the youth level but also the senior level. His first goal yesterday, in the 2-0 victory over Uruguay, will perhaps be the goal of the tournament. Having 5 goals in 4 games has him on pace to win this year’s Golden Boot, and also MVP of the tournament. He is one of the few young players, aside from Neymar, that has been able to lead his country at this year’s tournament and really raise his profile and value. That has not gone unnoticed to the sharks of the old continent and Monaco maybe end up being too small of a pond for a fish this big. Real Madrid seems to be interested in signing James Rodriguez and he has said that he would see a move to the Spanish league as a huge step in his career. Madrid loves players like James Rodriguez and he is poised to shine at a much bigger stage surrounded by bigger stars. I would be surprised if Monaco was able to retain him for another season after this World Cup campaign. For now his mind is not on where he will be playing club football, but rather on the match up with Brazil and Neymar in the quarter finals on Friday. Not only Colombia will be watching, but the footballing world will also be keeping their eyes on James Rodriguez, the boy wonder.